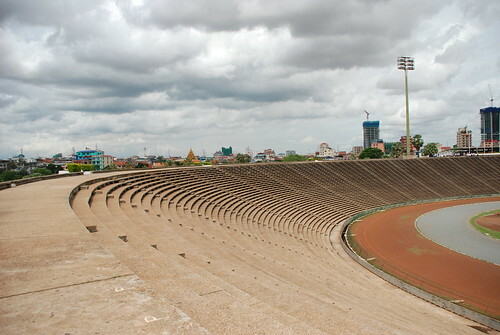 This is the Olympic Stadium complex in Phnom Penh, Cambodia. 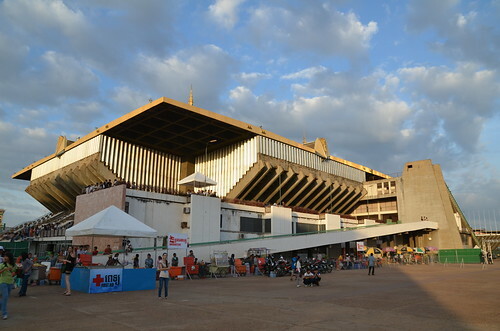 It was designed by renowned Cambodian architect Vann Molyvann and opened in 1964. The 60,000 seat stadium is the anchor-piece in the middle. Reminiscent of Autzen Stadium in Eugene, OR it was created by excavating 500,000m3 earth and its grassy banks give it the appearance of being scooped out of the ground. 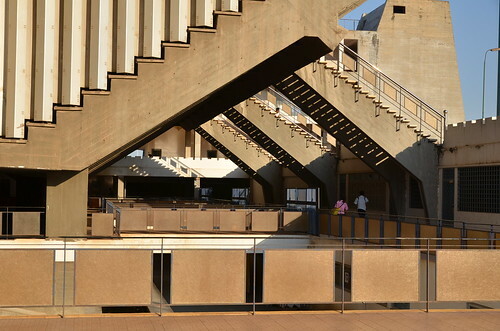 The stadium is flanked to the left by an 8,000 seat arena, and to the right by an 4,000 seat swimming and diving pool. In the foreground are numerous public basketball, volleyball and tennis courts. As the images below taken by architect Shelby Doyle attest, it is an astonishingly beautiful, sensitively designed, boldly conceived set of buildings whose history can teach us an interesting lesson about how such complexes are used after the event for which they are designed, especially in this Olympic year.Modern in its language and materiality, this building is very much Cambodian. In this hot, humid climate where heavy rains can lead to extensive flooding, controlling the elements is critical. 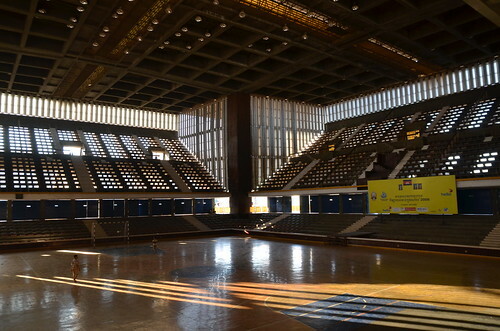 The bleachers for the arena are concrete and an ingenious system of concrete screens integrated beneath the seats creates natural ventilation and a lighting effect on the interior that is truly sublime. 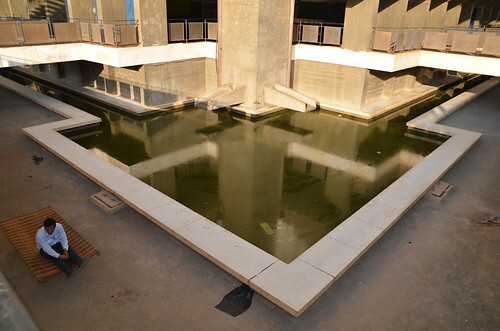 Additional use of water treatment pools, shade-casting roofs, and natural ventilation this complex creatively manages the extreme weather with sophistication and style. 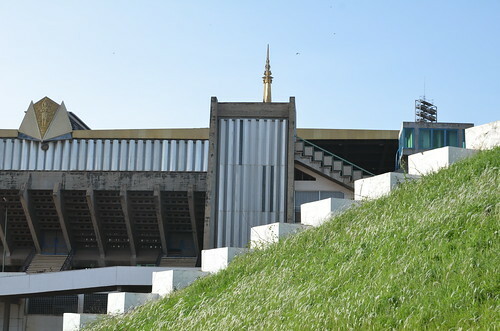 Designed for the Southeast Asian Games of 1964 which were never held, the stadium complex instead hosted the international GANEFO Games (Games of the New Emerging Forces) in 1966. The complex fell into the hands of the Khmer Rouge regime during their horrific reign of Cambodia and was used as an execution site on occasion. The years that followed left the site abandoned and in disrepair until 2000 when a Taiwanese company refurbished it in a larger real estate development. Today, the site is used for recreation purposes. 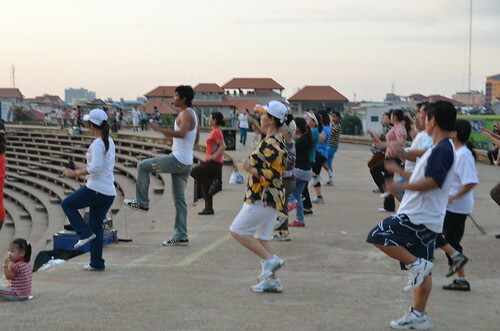 For a nominal fee, residents of Phnom Penh can use the facility to play sports or take classes and as a result, the complex seems more community center built to Olympic standards than an Olympic Stadium. As we get ready to kick-off another Olympics in a few weeks in London, and as the previous Olympic Stadium in Beijing lies empty, what a great legacy for this ambitious sports complex. Despite some recent concern that the stadium would be demolished in a larger real estate development, such rumors were recently squashed and it seems the stadium will remain for years to come.